It is best to select a Bresse chicken but a free-range chicken would also be suitable. To sear the chicken do not use a roasting pan that is too big. Cut the chicken on a board into 8 pieces, season with salt and pepper. Also cut the bones into small pieces. 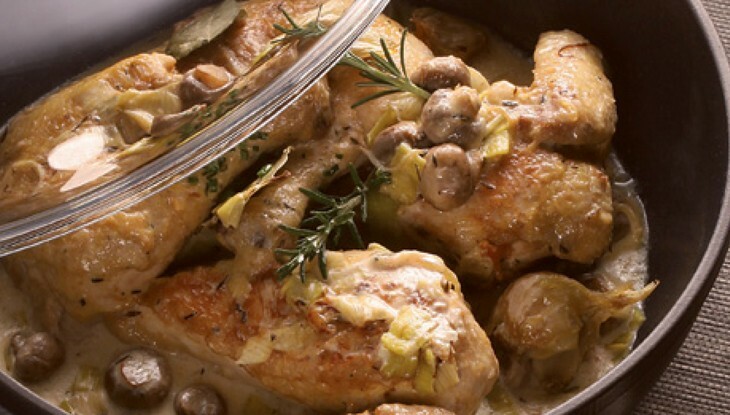 Melt the butter in a simmering pan, add the chicken pieces in 3 portions to sear until they are lightly browned. Start with the two wings and the breast meat. When they are brown, remove them. Then add the legs, the onions and the unpeeled garlic and the sliced carrots to the pan. When everything is lightly browned only remove the chicken pieces and in their place add the bones. The onions, garlic and carrots remain in the pan to sear for about 5 minutes. Then put everything back into the pan. Dust with a tbsp. of flour, stir and then add the white wine and water. Add the bouquet garni. Cook on a strong heat for 20 minutes until about 2/3 of the liquid has boiled away. Then remove the chicken pieces and the onions and keep them warm on two deep plates. Continue to cook the contents of the pan (bones, garlic and bouquet garni) till it is reduced by half. Pass the reduced sauce through a fine sieve into a small pan. Bring to the boil again. Add the créme fraîche. Cook for a further 3-4 minutes until the sauce becomes light and creamy. Reduce the temperature as much as possible. Then arrange the chicken pieces on the pre-heated serving dish and pour the sauce over it.